Usually wheel bearings fail quite gently. They’ll get a bit loose and are noticed during a service or from a bit of a noise whilst driving. Then they’ll still keep going for a while, long enough to get them replaced at a convenient time. That’s boring. It’s much more exciting to have the bearing suddenly explode on the Nullarbor! I mentioned in the previous post, as we entered the highway from Eyre Bird Observatory, I heard a momentary grinding noise. Stone in the brake drums I thought, although I was a little concerned it could be something worse. We camped at a rest area on the side of the road around 40km west of Mundrabilla. Next morning we hit the road, expecting to be in Ceduna, South Australia by that afternoon. That was Wednesday. It wouldn’t be until Tuesday the week after when we arrived in Ceduna. Diff oil everywhere. Is that normal? Let’s be optimistic. Maybe the oil seal is completely stuffed but the bearing is good enough to limp into Ceduna at low speed. At over 650km away it’s a bit of a stretch but might be possible. Between us and Ceduna there’s only roadhouses and tiny settlements. I decided to drive to the next clearing so I could get my tools out and look at the condition of the bearing. A few km down the road there was a rest area. I stopped and got started on removing the axle. Except I couldn’t, because everything was too hot. Smoking hot. The diff oil was burning. Not a good sign. After letting it cool off I got the axle out and was presented with a completely rooted bearing. Like wheel nearly falling off. The ABS rotor had sheered off from impact with the bearing cage, the axle had scoring on it from impact with axle housing and the rubber boots on the brake cylinder had melted off from the heat. So we were leaking brake fluid too. We were only 10km out of Mundrabilla but even that was a stretch with the condition of the bearing. We had phone reception so Sharni and I played around on our phones looking for Ceduna towing services. Wow they should have told me to get the defibrillator out before providing the quote: $3900. 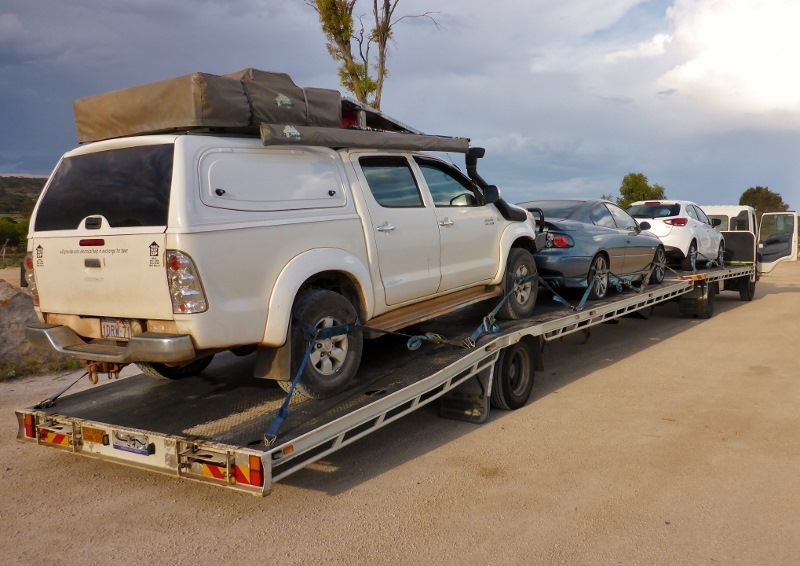 We could get a cheaper tow to Eucla but there’s no mechanic there. We decided to very slowly drive to Mundrabilla and make a plan from there. Upon arriving we promptly ordered ice-cream and beer at the bar and asked the staff for advice. A few phone calls and a few conversations with truckies later, we decided to try our luck finding a tow with passing trucks. And we got lucky. It wasn’t long before we were on the back of a truck heading east. We could only be taken as far as Nundroo, a tiny settlement 150km before Ceduna. There’s a resident mechanic in Nundroo and we had chatted to him on the phone, confirming he could help us. Greg the truck driver you’re a legend! Thanks for your help. We arrived at Nundroo no probs. We offered Greg the truckie some money and he would only take 100 bucks. Only enough to cover some extra fuel and the delay. What a champion. It was a wednesday night when we arrived in Nundroo. Thursday morning I was chatting to Wayne the mechanic. New bearing might be in Friday morning he reckoned depending on where one could be sourced. Later we found out there was no suitable bearing in Ceduna and it had to come from Port Lincoln. The bearing would arrive Monday and we wouldn’t be getting out of there until Tuesday afternoon. Nearly a week in Nundroo. Awesome! Whilst we waited for the part I decided to take the axle out myself to save Wayne’s time. I pulled out the axle, turned it vertical and rested the end of the axle onto the ground. 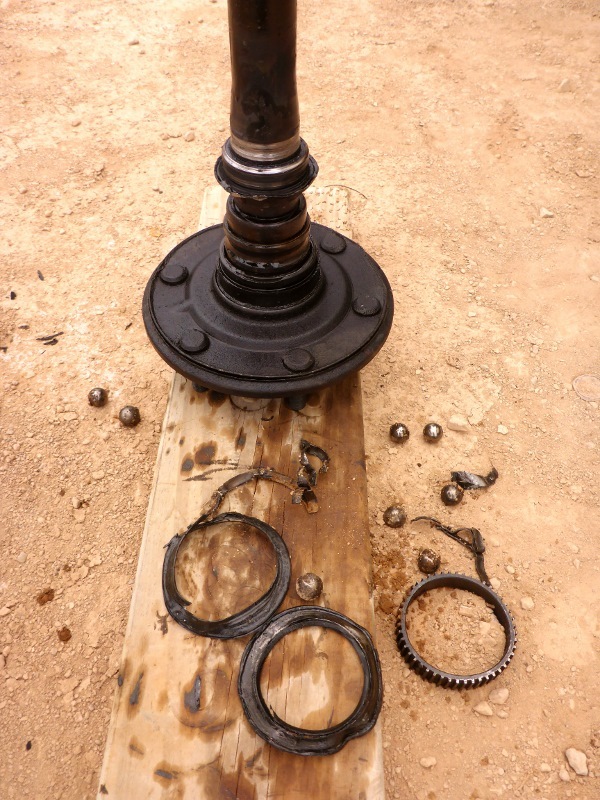 Upon impact with the ground all the balls fell out of the bearing and the hub separated from the axle. Wow that was close! 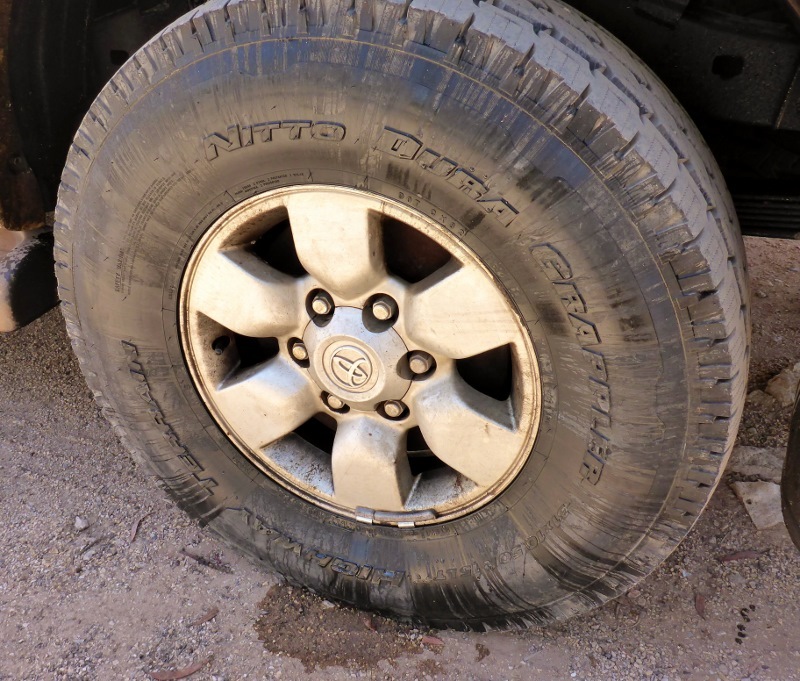 If we drove much more we would have had the wheel fall off and a whole lot more damage. There should be a hub and bearing on this axle! So we had almost a week to enjoy in Nundroo. I’ll save that for the next post. Sweet Jesus Joe – I also had a heart flutter, when I saw nearly 4K for a tow….. I don’t know about you cobber, but I am certainly in the wrong game. PS. it is mandatory to drink Coopers Sparkling Ale only, whilst travelling in SA – HA! Ha Coopers Sparkling Ale ay. I don’t think they had that at Nundroo. We’re out of SA already, will have to conform to your ruling on the way back. Hopefully nothing will break and we’ll have more time around SA to sample the sights and the Ales. Wow Joe — what an adventure – hope you get everything rolling soon and don’t get trapped in any heatwaves. Yes we’re rolling already and all ok. Been cold and grey in Melbourne, although the weather is changing for the better for christmas. The sun is finally out today. Would the $4k have been covered by the RACV (etc)? PS: Just found your site via your roof top tent review – one of the best, most comprehensive articles I’ve read for a while. Appreciated. Well done. Hey Smithy yeah i think with road side assist it probably would have been covered but i dunno the conditions and limitations. The guys doing the towing out there have a good wicket. Doing mostly insurance tows, good rate, regular work. We’re self insured!